Stripping wet wallpaper backing off a wall. When it comes to removing wallpaper, one of two things can happen. It will remove easily once you put the stripper on or it can give you a horrendous headache when it decides to come off in little pieces. This is why there are many solutions that have been a result of trial and error at home to find the perfect way to remove wallpaper without causing you to attack the wall out of sheer frustration. A solution you can make at home and probably have all the ingredients for already is simply mixing a solution of 1/3 vinegar and 2/3 water. This will be put in a spray bottle and spray it generously on one section at a time. You will need something handy such as a towel or sponge to soak up any that runs. This solution should be left for about ten minutes and then use a straight edge blade to lift up one edge of the wallpaper and it should peel from the wall. The vinegar acts as a melting agent on the glue and this should help the paper to loosen and make it easy to remove. Sometimes the wallpaper backing will stay on the wall. If this happens, just spray it again with your vinegar solution and wait, and then use the blade to loosen the backing. Many times the solution you are using will soak into the wallpaper more easily if you poke small holes in it. Use a commercially available wallpaper scoring tool like a Paper Tiger. You have to be careful so you do not damage the walls. 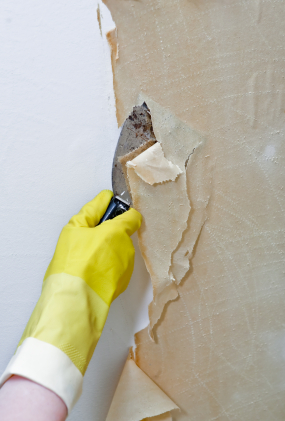 Small nicks can be repaired by using a little dry wall mud and sanding the walls once you have removed all the wallpaper. If you are facing really tough wallpaper removal, you may have to use an electric sander to remove the bottom layer of paper and the glue. Most wallpaper today has a vinyl covering that actually will come off first. This leaves the backing of the paper and the glue, so if this does not come off easily, it is time to resort to a sander. Pole sanders are often used in combination with 100 grit sandpaper to start. This will work for some wallpaper and will not for others. However, if you need to use an electric palm sander, you will probably still need to do a little repair on the wall with drywall mud. Another solution that has had success at removing wallpaper is one part fabric softener to two parts warm water. This can be sprayed on the wall or sponged on and left to soak in for five to ten minutes. The fabric softener will soften the glue and allow you to peel the wallpaper from the wall. Another product that many people say works wonders at removing wallpaper and the glue residue that is sometimes left is Dawn dish detergent. The anti-grease cleaners that it contains loosen the glue as well. Make sure that the soap you are using will not damage your wall as many harsh soaps can also remove the top layer of drywall and if too much water soaks into it, this could cause it to crumble. A steamer that you have lying around the home is another method that people have used to heat the glue on the wallpaper to make it peel more easily. They make a commercial steamer for this but often clothes steamers for removing wrinkles have been used. This can be done a section at a time by steaming the wallpaper and removing it before moving on to the next section. If you leave the steamer on a section for a few minutes, you should start to notice the paper beginning to ‘shrink’ from the wall. When wallpaper is put on, it stretches somewhat to conform to the wall while it is wet. When you use a steamer the wallpaper will in the best circumstances pull away from the wall. When you are ready to try one of these methods, make certain that your floors are protected by either a drop cloth or some plastic sheeting. After all, you do not want to try and figure out how to get the paper or the glue to come off your hardwood floors.